The Wrecker (written in collaboration with Lloyd Osbourne) tells of the adventures of Loudon Dodd. Dodd is an American from Muskegon whose desire to be an artist disappoints his business-minded father. When Dodd’s father is contracted to take charge of the statuary for the Muskegon State Capital he offers Dodd a compromise: he will pay for Dodd to study in Paris to be a sculptor and in return Dodd will sculpt the Muskegon statue. On his way to Paris, Dodd visits his Uncle Adam in Edinburgh. He also meets his grandfather Alexander, who takes a shine to Dodd. In Paris, Dodd loves the Bohemian lifestyle and enjoys perfecting his art. One day, he meets Jim Pinkerton, “The Irrepressible” (p. 96). Pinkerton has his hand in several business ventures at once, and is always searching for the next way to make his fortune. Pinkerton also strongly values Dodd’s friendship and opinion, although he often embarrasses Dodd, or places him in awkward situations. Dodd now hears from his father who mentions his finances are floundering. He asks Dodd to send him a certificate from his art teacher that the statue is up to market standards. He will then send Dodd $10,000 to spend as he likes. Dodd gets the certificate, but then learns that his father is penniless and ill. He tries to send what money he can, which arrives in time to pay his father’s funeral expenses. Pinkerton now proposes that Dodd and he go into business together. Dodd still hopes to make it as an artist, however, and refuses. Pinkerton now leaves for the States and Dodd is left, poor and alone in Paris. One day, Pinkerton sends him some money, promising to support his art. Dodd accepts his generosity, but soon feels guilty and resolves to join Pinkerton in business in the States. On the way, he stops in Edinburgh to ask his relatives for money to repay Pinkerton. Alexander, who considers him a favourite, gives him £2000. In San Francisco, Pinkerton has many “irons in the fire”: he makes and sells his own brandy, runs an advertisement agency, charters a tug boat, buys wrecked and condemned ships, amongst other ventures. Working as a clerk, Dodd learns that Pinkerton invests both their money in whatever new scheme takes his fancy. Occasionally, Dodd drinks by the San Francisco harbour. One day, a group of sailors – Captain Trent and the survivors from the Flying Scud – enter the bar. Trent, who seems terrified, recounts the terrible storm at sea which destroyed their ship. Later, Pinkerton learns that the wreck of the Flying Scud is to be auctioned. Lying in Midway Island and filled with silks and teas, it could be worth $10,000. Pinkerton and Dodd decide to buy it, but at the auction, the lawyer Harry D. Bellairs keeps outbidding them on behalf of an outside party. He bids so highly, that Pinkerton and Dodd are convinced the ship must contain opium. At last they manage to outbid Bellairs and buy the ship for $50,000. While waiting for Pinkerton after the auction, Dodd sees Bellairs make a phone call – he realizes he must be calling the outside party. Once Bellairs is gone, Dodd asks the operator to call the number again, and asks the man who answers why he wanted to buy the ship. The man anxiously hangs up. Pinkerton and Dodd now visit Bellairs at his office to find out more about the wreck. He tells them he was bidding on behalf of a Mr. Dickson. When they try to speak to Dickson, however, they learn he has already fled the city. Furthermore, Captain Trent and the rest of the men from the Flying Scud have also fled. Dodd and Pinkerton are both now suspicious and anxious about the wreck: even assuming there is opium on board, why did the bidding go so high? Why did all the people connected with the wreck leave the city so quickly? 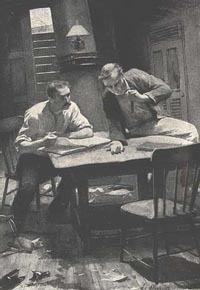 Despite their worries, Dodd and Pinkerton find a ship, the Norah Creina, and a crew. Pinkerton will stay behind to oversee business at home. Dodd will accompany Captain Nares and the crew of the Norah Creina to Midway Island. They will break up the wreck, stop in Honolulu to sell the opium and then return to San Francisco. Just before Dodd and the ship leave, Pinkerton marries his sweetheart Mamie McBride. The Norah Creina now arrives on Midway Island. Nares is immediately suspicious, however, when he realizes that the Flying Scud has no damage – why would the crew abandon a perfectly seaworthy vessel? Furthermore, the men search everywhere for the opium, but find only a small amount – why then had the ship sold for so much money at auction? The men also find a photograph of the crew – but the man labeled Captain Trent is certainly not the man Dodd saw in San Francisco. Perplexed, and wishing to avoid scandal, the men decide to cut their losses and go to Honolulu. When they arrive, Dodd learns Pinkerton is bankrupt and he writes asking for whatever money he can get. Despite this, Dodd puts everything in the hands of the creditors so that he and Pinkerton won’t be associated with the mysterious business of the Flying Scud. Dodd notices that the HMS Tempest is in Honolulu harbour. This ship was responsible for rescuing the crew of the Flying Scud and he vows to find out more information. He meets Sebright, of the Tempest who tells him that he recognized a man from the Scud calling himself Goddedaal as Norris Carthew, an Englishman. Carthew became unwell when he boarded the Tempest and was treated by a doctor. Significantly, Carthew had recently learned his brother had died, and that he was now a wealthy proprietor. Dodd decides to ask the doctor for more details on this mystifying revelation. The doctor, however, will only say that whatever happened should be excused. Dodd now realizes that Dickson from San Francisco must be Carthew trying to buy the Scud and keep its secrets. But what are these secrets? Back in San Francisco, Dodd is very evasive about the Flying Scud. This enrages Mamie and wounds Pinkerton, who has been very unwell since the bankruptcy. Dodd also receives a letter telling him his grandfather Alexander is dead and has left him £17,000. Overjoyed, Dodd can now help Pinkerton and his wife. Pinkerton and Mamie settle in Calistoga, where Pinkerton begins setting up his various business schemes. Dodd, meanwhile, learns that Bellairs is pursuing Carthew to try and blackmail him. Sympathizing with Carthew’s mysterious plight, Dodd resolves to help him. He follows Bellairs to England, where he will seek Carthew out. The men end up journeying together, and even develop a strange friendship. Bellairs is an unhappy man: he married a woman who incurred huge debts and who then ran off with another man. Nevertheless, Bellairs still supports her, and desperately needs the money he will get from blackmailing Carthew. After drinking himself into a stupor and losing what little money he has, Bellairs begs Dodd for money. Instead, Dodd promises to pay for his return to San Francisco so we will leave Carthew alone. Bellairs is incensed and demonstrates his “latent and essential madness” (p. 316) – he storms away, vowing to hunt Dodd and Carthew to the ground. Carthew and Tommy Hadden had met in Sydney and decided to buy a ship to cruise the islands. They bought an old ship which they called the Currency Lass. Early in their travels, trade brought them a chest full of money. A storm then dismasted their ship and taking boats, they rowed to Midway Island. They waited for many days for rescue, when at last the Flying Scud appeared. Captain Trent demanded that they give him all the money from their chest in return for safe passage to San Francisco. Tempers flared, and one of Carthew’s men, Mac, killed Trent. A fight ensued and Carthew and the men killed all of the crew of the Flying Scud. They now saw the Tempest in the distance. To avoid arrest and scandal, the men pretended to be the crew of the Flying Scud. Carthew also vowed to buy the Scud so no one would learn the truth and his family name would not be tarnished. As Dickson, he hired Bellairs. When Dodd had phoned him asking about the wreck, he had panicked and fled. In an epilogue to the novel, RLS tells what became of all of the characters. Carthew and Dodd went to Persia, where Carthew fitted a schooner for Dodd to trade in the South Seas. Pinkerton had another bankruptcy, but started up a new venture with Captain Nares. Bellairs returned to San Francisco and died in hospital. Quotations from The Wrecker, The Works of Robert Louis Stevenson, Swanston edn, vol xiii (London: Chatto and Windus, 1911). This entry was posted in Novels and tagged novels. Bookmark the permalink.